Decorated loom weight publishied in Milesi, 2013 (This photo copyright: A.C. Valera). Although it is not a figurine (in the sense that is not a sculpture), this is a quite interesting piece. It is half of a loom weight that has part of an anthropomorphic figure depicted in one side and a set of zig-zag lines in the other. 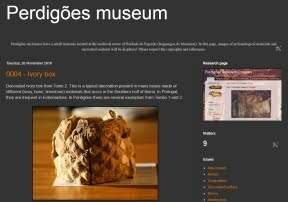 It was collected in Sector L of Perdigões, in the context of gate 1, in the excavations carried out by Málaga University team and was published this year (Milesi et al, 2013). This piece has, at least, to major factors of interest. 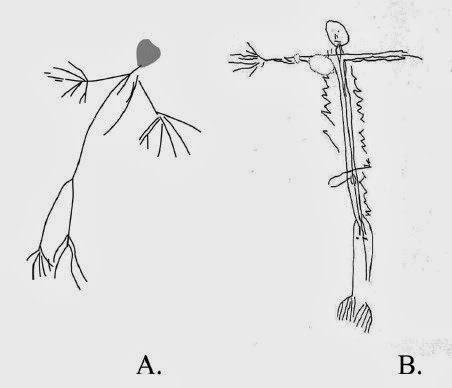 First it has a representation of the human body in a schematic-linear style associated, in the back, to what we might interpret as the long hair that is present in many anthropomorphic figurines (see here). This could justify a connection between this two forms of anthropomorphic representation. 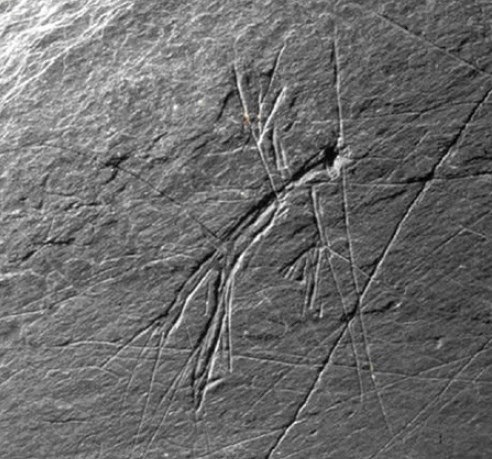 Secondly, the representation of the anthropomorphic figure has great similarities with other rock art depictions also using the schematic-linear style, usually with the hands and feet represented in a radiate way. The similarities are striking with the anthropomorphic figures represented in Rocha da Hera (Vilhena e Alves, 2007) in the Mira valley, Molino de Manzánez (Collado Giraldo, 2006) and Agualta 7 (Alves, 2013), both in Guadiana valley and very close to Perdigões. The image from Agualta 7 even has two zig-zag vertical lines, suggesting the representation of the hair. A. La Madre del Cordero, Molino de Manzánez (after Collado Giraldo, 2006); B. Agualta 7 (after Alves, 2013). These anthropomorphic figures in schematic-linear style are not very frequent and their chronology is not easy to establish. Because they appear near proto-historic contexts they have been considered to date from Bronze Age or Iron Age. However, Agualta 7, for instance, is next to a Late Neolithic and Chalcolithic site (Moinho de Valadares). The stylistic similarities with the representation from Perdigões shows us that this kind of anthropomorphic depictions go back to the 3rd millennium BC and that this chronology could be extended to some of the figures carved in rock art (such Agualta 7). In particular, since the middle of that millennium, when more explicit representations of the human body seams to became more frequent. Alves, L.B. (2013), “Anexo 1. A rocha gravada de Agualta 7”, (A.C. Valera cood. ), As comunidades agropastoris na margem esquerda do Guadiana. 2ª metade do IV aos inícios do II milénio AC, Memórias d’Odiana, 6, 2ª Série, p.505-538. Collado Giraldo, H. (2006), Arte Rupestre en la Cuenca del Guadiana: el conjunto de grabados del Molino Manzánez (Alconchel – Cheles). Beja (Memória d’Odiana – Estudos Arqueológicos de Alqueva; 4). Vilhena, J. e Alves, L.B. (2007), “Subir à maior altura. Espaços funerários, lugares do quotidiano e arte rupestre no contexto da Idade do Bronze do Médio/Baixo Mira”, Vipasca, nº2, 2ª série, p.194-218.